Here are a few of the songs that inspired scenes in Lilac Girls, and in the case of Emmanuel, the tone of the whole book. His music was my original musical inspiration for the book way back when I started writing it. My daughters and I met Joshua in Paris and though already a fan, I became hooked for life. Nothing captures the 1940s mood like Seraphic Fire. Love their Christmas album. Great, fun songs for evoking the happier scenes. This never gets old. Always inspiring. For me, really captures what Lublin, Poland went through in WWII. Just because it’s amazing and evokes happiness like no other song. Great for conjuring the feeling of a difficult relationship. 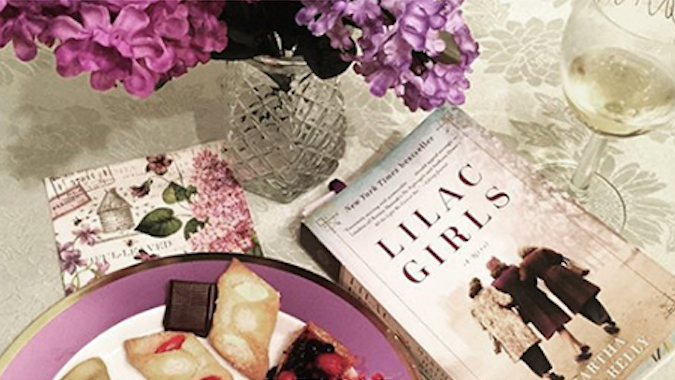 It means the world to me to hear that you enjoyed Lilac Girls…my goal when writing it was to showcase these women whose story had been forgotten and help people understand how moving it was, so I’m thrilled that you connected with it in a deep way! p.s. I have a list of books re. the subjects in Lilac Girls, which I will eventually put on my website. If you’d like a copy I can email it to you. Martha, thank you for writing this lovely yet haunting piece of women’s history during WWII. Without courageous and hardworking writers like yourself, so many stories would be lost to the world of reading forever. I noted in my ARC a mention of a listing of references and after searching your site didn’t find them. I’m assuming that in all the busyness of launch date and marketing it’s something that hasn’t happened. Any chance you could share your listing with me via email or notify me when it goes up on the site? I’m very interested in knowing more about these women and their courage. Thanks for an incredibly powerful read. I’m off to review it now! Thank you for all the wonderful support, Sherrey. I just sent you an email with an answer too long to be contained here. Hope you enjoy reading more about the story! What a wonderful read Martha! Actually, I listened on audiobook, which really lent itself to more tears, laughter, and emotion. I have always enjoyed books about this time in history and never heard about the Rabbits previously. I would LOVE to see this book come to life in the theatres for so many others to see. Thanks again for your many years of research that went into this wonderful work! I too am interested in learning much more and would appreciate that list of books or other resources you mentioned. Also looking forward to the prequel as I crave to know more! Take care & best wishes on your book tour as you continue to shine a light on these lovely ladies that endured such a journey. Thanks so much, Kris. I am working on a list of books to put on the website, but for now I included a short list at the end of the hardcover.There are SO many good Ravensbruck books…if you search on Amazon or Google about ten come up, all worth reading! I especially liked Ravensbruck: Everyday Life in a Women’s Concentration Camp 1939-45. It describes what life was really like at the camp. You may also enjoy reading The Dawn of Hope: A Memoir of Ravensbrück by Genevieve De Gaulle Anthonioz, which details General De Gaulle’s niece’s imprisonment there. I don’t know why I am so drawn to Holocaust stories, probably because they display such human resilience and I am trying to understand how one race could perform such atrocities to another. One of my first jobs in the late 1970s was as a cashier in a predominately Jewish community store and I witnessed war camp numbers tattooed on the arm of an elderly woman who regularly shopped there. There seems to be a large number of books published lately about WW2 and my theory for this is that most of this generation is gone and the relatives of survivors are telling the tales of these survivors. This book was not what I expected and I appreciate your view on Herta Oberheuser because it has given me a new perspective on how these individuals viewed their actions. Her crimes are no less horrendous to me but for the first time, I can see how they viewed their situation. This book gave me a lot to think about and as an American, I am proud of the diligence of Caroline Ferriday in getting help for these heroic women. Thank you for bringing this tragic story to the attention of the world. Can you recommend some books that you feel strongly about that write about World War II and the Nazis …. The Lilac Girls is an awesome book…quite an education I received while reading it. Tears and Love …. Have you read The War that Saved My Life or The Orphan’s Tale?